While NASCAR wrapped up its West Coast Swing in somewhat pedestrian fashion, it returns to the East Coast in what should be an easygoing STP 500 at Martinsville, right? Think again. By all means, the maxim that nice folks finish last absolutely applies to the 0.526-mile paperclip-shaped oval. If drivers decide to put on their best Sunday attitude, let’s just say they’ll find themselves in the wall. Or in some cases, they’ll wind up as frustrated as Martin Truex Jr in last fall’s playoff spectacular. As former NASCAR driver once said about Martinsville, competitors must “Stand on the gas and swap some paint.” In this case, it’s rare that the winner’s car will be in Bristol fashion (and not the short track in Tennessee). When all is said and done, chances are likely that race fans across the world may want a replica of the winning car. 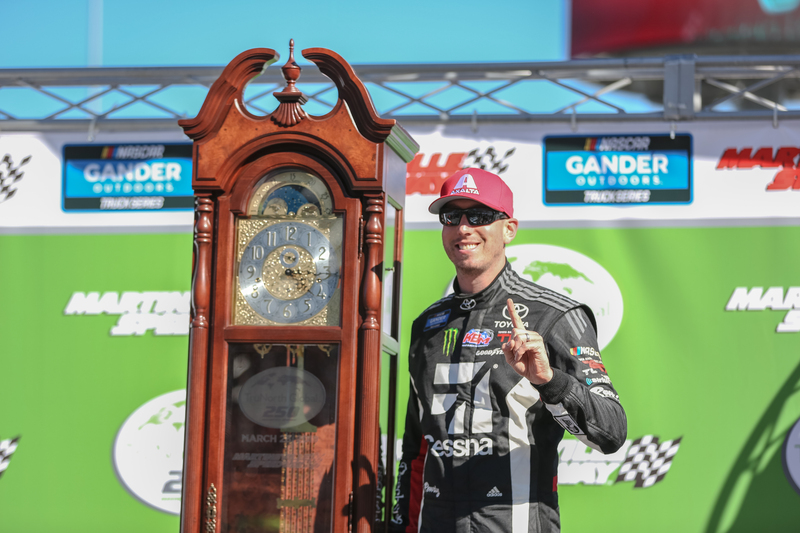 While we won’t be pursuing a grandfather clock, The Podium Finish’s columnists, Adam Lucas, Amanda Shoopman, Ashley Hobbs, Christina Bowman, Jose Acero Jr, Kathleen Cassidy, Katie Coople, Kobe Lambeth, and Matt Sisoler weigh in on Kyle Busch’s latest milestone and analyze NASCAR’s oft-discussed rules package. Kyle Busch scored his 200th and 201st total NASCAR wins across the top three series. How should fans and press perceive this milestone in relation to the sport’s greatest racers and their accomplishments? Acero : You either love him or hate him. What Kyle Busch is doing is amazing, probably won’t happen again in our lifetime. Fans should appreciate everything he is offering on track. Yeah, many hate the fact that the media is comparing him to Dale Sr and Richard Petty. Each driver had that one characteristic that made each unique. Let’s just sit back and enjoy racing and continue to witness greatness in the making. I mean, he can’t win every weekend, right? Bowman : Fans and media should perceive it however they like. What I think should stop happening is the comparison of Kyle Busch (or any other drivers’ success in the modern era of NASCAR) to drivers who raced in the onset of the sport. Kyle Busch’s accomplishments are amazing. Richard Petty had a one of a kind career! Jeff Gordon is a legend. There is no need to compare the greats when each of them are simply outstanding and deserve all the accolades. Cassidy : This is a huge accomplishment for NASCAR! Love him or hate him, 200 total NASCAR wins is impressive. The history of NASCAR is important, however the changes of the future make it that much better! Keep pushing Rowdy! Copple : Kyle Busch is a talented driver, you can not deny him that. This is a great accomplishment! 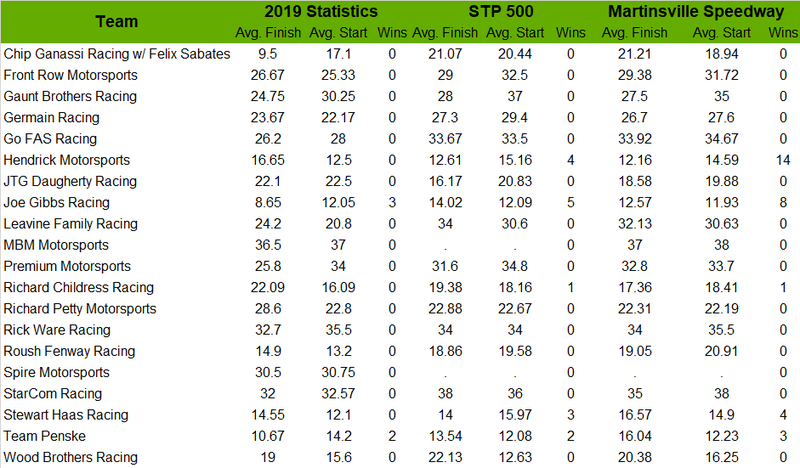 But, and here is where a lot of people will probably disagree with me, many of those wins are in the lower series, racing against drivers who are half his age and with half of the time behind the wheel. The chances of him winning in Trucks or Xfinity when he’s in the field are high. 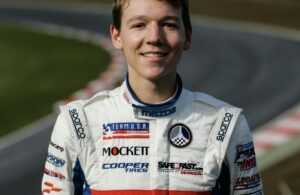 He’s a top series driver racing with drivers just cutting their teeth in the sport. That is something that needs to be noted here. Yes, he deserves recognition for 200 wins, but should he be compared to the likes of Petty, Earnhardt, and Gordon? Not quite yet. Hobbs : Fans and non-fans alike should be applauding Kyle Busch for this accomplishment. Sure, drivers like Richard Petty and Jeff Gordon got their big numbers racing in the top series, but Kyle Busch is in a league of his own. Sure, 47% of his victories have come in the Xfinity Series with the remaining 53% split evenly between Cup and Trucks (26.5% each). This accomplishment at Auto Club Speedway puts Rowdy one spot away from being in the top 10 for Cup Series wins. Only one active driver has more wins than Rowdy; Jimmie Johnson. Fans, and non-fans alike, need to acknowledge that Kyle Busch can race a car (or truck). While some may not like him because of his attitude or that he races too much in the lower series, his talent is undeniable. He is a master of all levels and this 201 total NASCAR career mark will be talked about for the next generation of drivers and fans. That number will continue to grow; Kyle Busch is not even close to being done. 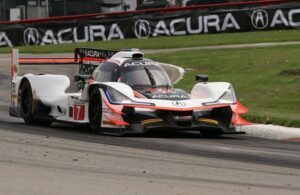 With three races in the books with the new aero package, what grade would you give in terms of intention and actual on-track results? Lambeth : I would like to wait until the Coca-Cola 600, before I give the 2019 aero package a fair grade. I have mixed feelings about it. Atlanta was a good race by 1.5-mile track standards, which produced an exciting finish between Brad Keselowski and Martin Truex Jr.
To be honest, I was a tad disappointed with the Las Vegas race because I expected something a little more. It was probably due to the amount of hype heading into the event. Nevertheless, the cars were closer and we saw another exciting finish. Fontana was basically just a slower version of what we have seen at the track for years. It is still early days with the package, so I’ll continue to be patient with NASCAR’s latest experiment. I have an overall issue with the judgment of the package too. Atlanta and Auto Club are abrasive and worn out surfaces that after about five laps, the cars begin to spread out due to tire wear. It’s like walking a fine line between insanity and compliance. We fix one aspect, yet kill that momentum by taking a backstep in another. I truly believe that Texas will be a good judgment of the package due to its recent repave and reconfiguration. If Texas goes the same way as Las Vegas, I hope that there’s a contingency plan of action to help the overall package. Shoopman : I would like to wait a few more races before giving the aero package a grade. We are not exactly seeing the tighter pack racing that the new package was supposed to promote. However, we are still in the beginning of the season, so I believe we should hold any final judgments until we are a few more weeks in. Sisoler : Personally, I think I need to see more usage of this aero package before passing judgment. 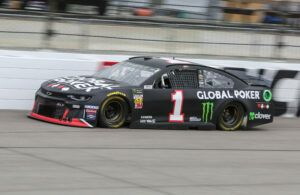 The racing has been OK, but it’s not really been living up to what NASCAR said it would produce: close, hard-fought pack racing all the way through races, and hopefully with teams getting better and better at running this package, the pack racing will show itself. However, it hasn’t yet, but time will tell if this package is a stud or a dud. 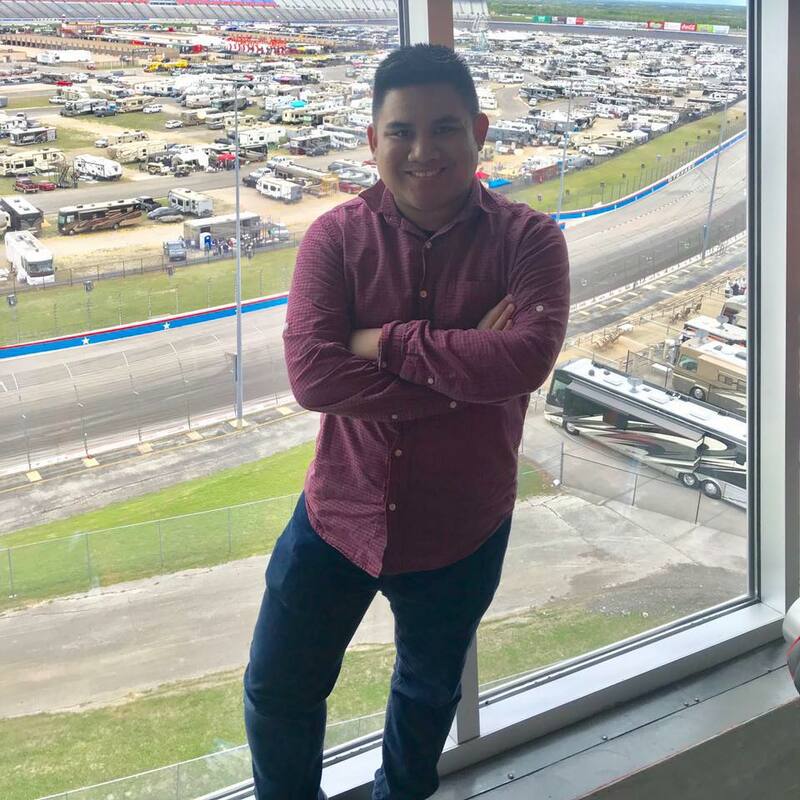 Tiongson : All things considered, I want to give it more races before I assess NASCAR’s latest attempt to improve its on-track product. I’ve seen awesome restarts. However, we aren’t seeing the close, side-by-side racing on a sustained lap-by-lap basis. Furthermore, if this package was supposed to promote a form of pack racing, it’s certainly not doing that at all. 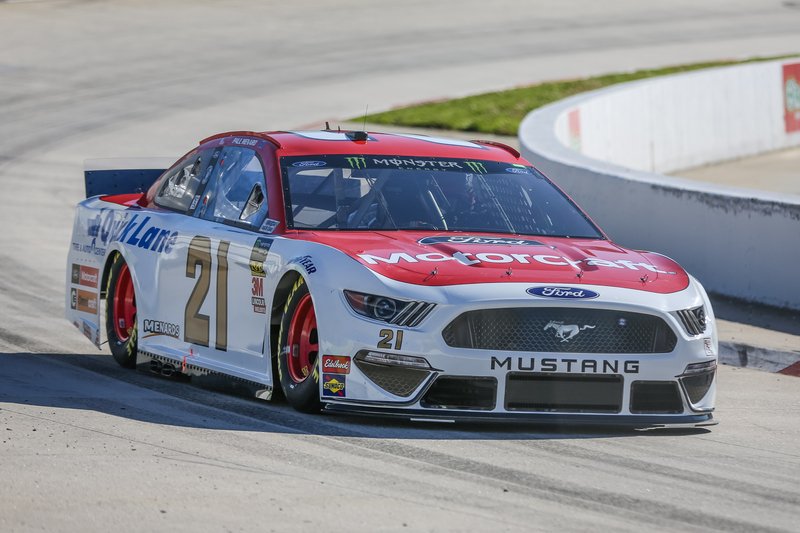 Our monthly columnist Landon Cassill suggested that NASCAR could take more horsepower away and I’m wondering if that’s the route that should be explored. In either event, I feel there’s more that could be done and it’s right up there with the not so wonderful qualifying sessions we saw this past weekend at Fontana. Two laps around Martinsville and nobody needs some Goody’s Headache Powder. However, some may have wanted it last weekend at Fontana. Without further ado, let’s rewind back to last Sunday’s 400-miler. Kyle Busch was the Candy Man in more ways that one. Meanwhile, Hobbs continues her strong start. 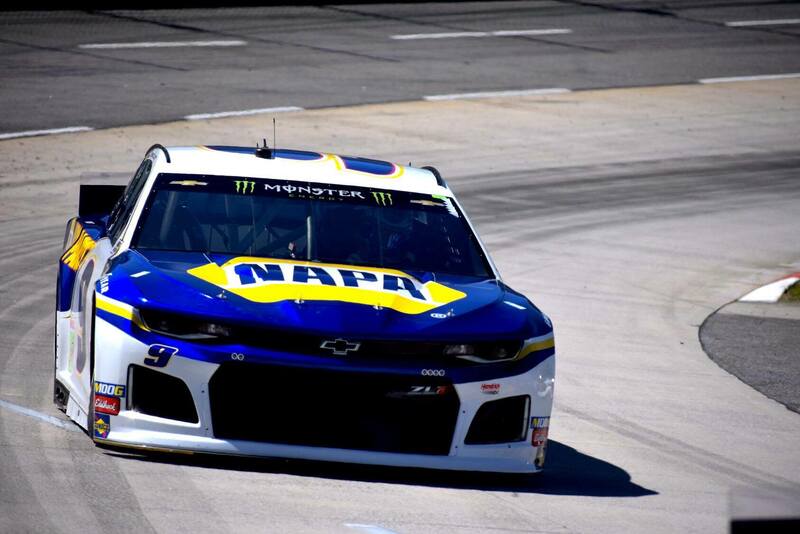 We’ve discussed some of the trending topics heading into the STP 500 while reviewing the last race of NASCAR’s West Coast Swing. Now, Ashley Hobbs wants to drop some knowledge by Crunching the Numbers! Will recent performance outweigh historical trends for teams at Martinsville? 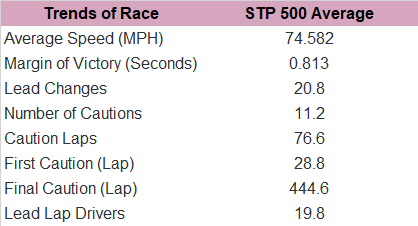 The average starting spot for the race winner is 10.6 while the average number of laps led by an STP 500 race winner is 123.1. 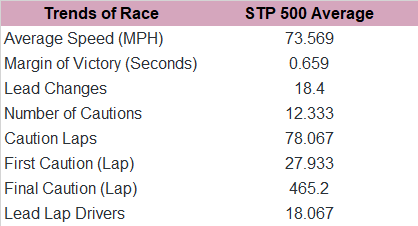 Averages for past three Cup champs with the STP 500. Trends in the past 10 races. Potent notable trends in the past five races. TPF Stats foresees another win for Kyle Busch at Martinsville. Tick tock, it’s time to get serious about winning at Martinsville. 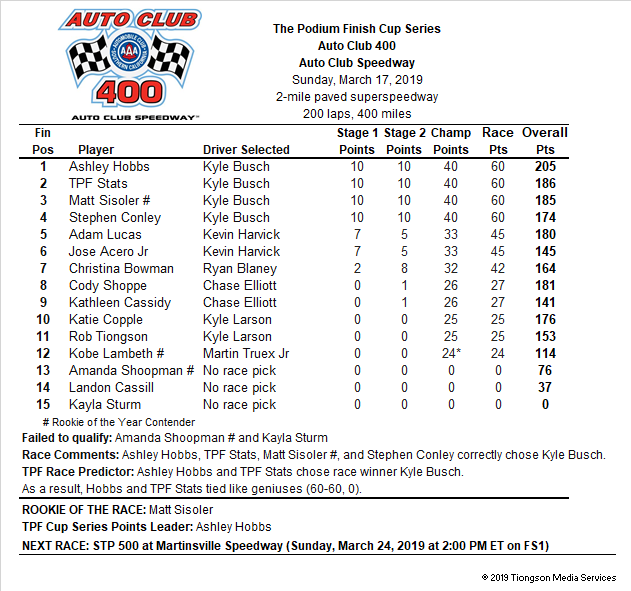 Here are our picks for Sunday’s STP 500! 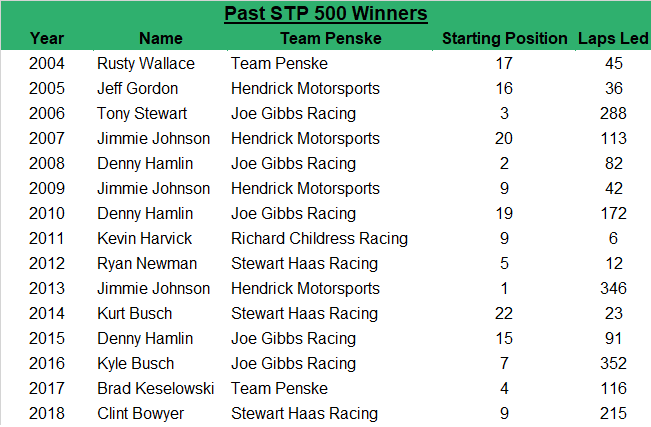 Powerhouse STP 500 race picks. Tiongson : Kyle Busch seemingly cannot lose a race. Then again, he’s won the past two fall races and he’s quite talented at Martinsville. Unless he suddenly does a Bobby Isaac on us, I’m going with Rowdy. 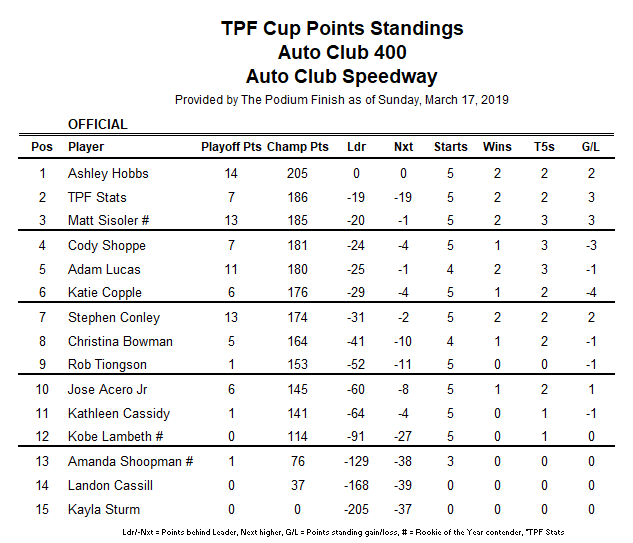 TPF Stats : It’ll be a close battle between teammates Kyle Busch and Denny Hamlin this weekend, but the odds are slightly in the favor of Rowdy this weekend. Hobbs : It’s hard to go against the best driver this season and one of the best at Martinsville. I look for Kyle Busch to become the winningest driver in NASCAR this weekend. Sisoler : Tricky choice this weekend. Anything goes on a short track, which is why I have to say Kyle Busch will take the checkered flag at Martinsville. Lucas : It’s hard to not pick the homestate boy Denny Hamlin. I think he picks up his 2nd win of 2019 and his 6th overall grandfather clock trophy. Acero : Hamlin. Don’t ask why. Bowman : Ryan Blaney earns some short track success. Shoopman : Ryan Blaney. It’s time. Copple : Chase Elliott takes it home this weekend. Lambeth : After performing well at ISM Raceway, the latest race with the 750 horsepower package, Jimmie Johnson will return to victory lane at the place, where he has experienced plenty of success in his career. Race fans, thanks for joining us for our preview of the STP 500!